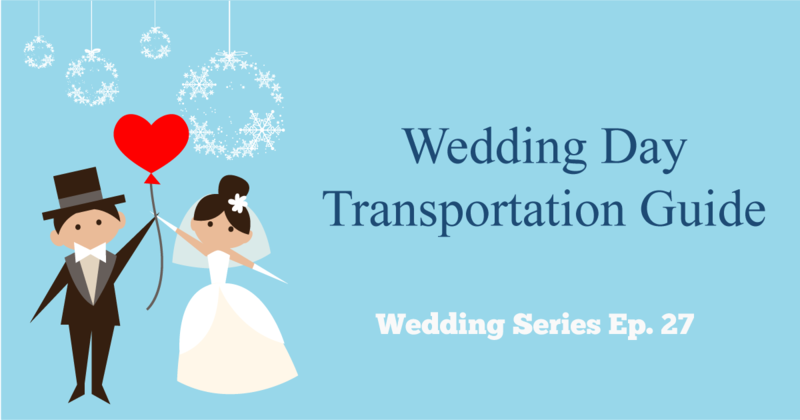 Today’s blog is one in a series on Wedding Transportation across the greater Philadelphia, PA area. Whether you are planning your own wedding or helping somebody you love to plan theirs, this blog series is meant to provide fun tips and ideas for a memorable Wedding celebration. If you are looking for the industry’s most luxurious Wedding Transportation company, call 610-222-6225 today and speak to a Kevin Smith Transportation Group Tour Wedding Coordinator. Your dedicated Coordinator will help you arrange all of your transportation, from Limos to Party Buses to Shuttles. The last thing on the mind of the on-the-go, wedding-overwhelmed couple is, well, probably automobiles. But to take a spin to (and from) the ceremony and reception — and making the ride as smooth as possible — means getting in gear. You’ll need to figure out the mode of transport for the two of you as well as your family and attendants, and maybe even some of your out-of-town guests. Hiring transportation makes a lot of sense; it gets people to sites on time and without incident (remember, you don’t want your dearest hitting the roads after a few glasses of champagne at the reception). The logistics (especially if the wedding has a guest list of 100, 200 or more) can be nightmarish, so get a move on it: Assess your needs and pick your approach, then book your dreamboat(s) well in advance of your wedding date just to be on the safe side. First things first: transport for the two of you. Like every other aspect of your wedding, selecting your own getaway mobile should complement and match your sense of style as a couple (not to mention that this is how your guests will remember you and your honey — pardon the cliché — riding off into the sunset). Do you see yourself arriving in a horse-drawn carriage or convertible red Mustang? Departing in a classy Rolls-Royce or rock-star stretch limo? Though the options are many, choose something that fits your budget as well as your personality. Now determine how many other people will need a lift. As for your family and attendants, think about who needs to travel together: treat parents, siblings, and grandparents to private town cars; move attendants as one group in limos. Out-of-town guests are another issue. Though it’s not the financial responsibility of the bride and groom to get guests around overall, it’s common courtesy to help out those traveling visitors who might not have cars. Don’t leave them to fend for themselves. The most cost-effective transport, of course, is to recruit friends and family to carpool with the out-of-towners but sorting out how to get everyone from point A to point B may become an unruly task if there are a lot of people to pair up from multiple origin points. If it’s too unwieldy to pull together a volunteer fleet and you opt to rent, do the math to see which option makes the most sense. Though limos and town cars are standards, don’t rule out less orthodox modes of transport for large-scale people moving: vans can hold nine to 15 people, and buses can fit between 40 and 60 people. Cover all your bases when devising your transportation schemes. When booking your cars for hire, consider the time your ceremony ends, how long it will take guests to get from one point to the other, and the hour your party is scheduled to start. If your exchange of vows ends at 4:30 p.m. and the reception location is only 15 minutes away but cocktail hour doesn’t begin until 6 p.m., you run the risk of having guests arrive while the space is still being prepared. Timing, of course, is everything, so try to schedule everything sensibly. If this is not possible, you may need to devise a plan for how to occupy any extra time between the ceremony and reception, or, if need be, discuss with your reception site manager the possibility of starting the cocktail hour earlier. Granted, some guests will be shuttling themselves around, so don’t forget about parking. Talk to the reception site manager and find out what your parking options are, and who handles the arrangements and staff. In the event that you may have to hire an independent service, tailor it to your needs. You can choose a full-service valet team, which will park your guests’ cars and retrieve them at the end of the night, or opt for parking attendants that merely direct traffic, hold signs, and guide drivers to empty spaces. Both options will run about $20-$25 an hour per person, plus a 15%-20% tip (usually tacked on to your total bill), but you’ll need more hands if you want valet parking. Figure five valets (or 3-4 parking attendants) for every 100 guests. A massive guest list, meager to non-existent parking facilities, and a complicated location will require more help and add to the cost. Before getting a price quote, make sure the parking service manager scouts out the location to see how many attendants you’ll need. Who pays for all of this? Traditionally, it’s the bride’s family that bears the financial burden of transportation and parking, minus the expense of getting the groom and best man to the ceremony (the groom’s folks traditionally pick up the tab on this one). The bride also foots the bill for getting the wedding party and family members around. Today, however, transportation is an easy way for the groom’s side (or even you and your partner) to step in and lend monetary support. To make sure everything runs like a well-oiled machine, keep a couple of points in mind. First, shop around and compare transportation prices about four to six months before your wedding day. If your ceremony coincides with prom and graduation season in May and June, absolutely get started early. Check out vehicles in person, ask what the driver will be wearing, and get it in ink. Be prepared for the big day beforehand: Create a call sheet with the names of guests and all pickup and drop-off addresses and times and call to confirm these arrangements with the car company the day before or morning of the wedding. Drivers should have all this information in advance, including detailed directions to the ceremony and reception sites. It’s also a good idea to give passengers a copy of the directions with an emergency contact number in case the driver gets lost. If you are looking for the industry’s most luxurious Wedding Transportation company, call 610-222-6225 today and speak to a Kevin Smith Transportation Group Wedding Coordinator. Your dedicated Coordinator will help you arrange all of your transportation, from Limos to Party Buses to Shuttle services for you or your guests. Thank you for reading today’s blog on Wedding Tips. Please visit us every week as Kevin Smith Transportation Group, Philadelphia’s only choice for Luxury Wedding Transportation, brings you the best tips and most insightful feedback on planning and celebrating your upcoming wedding.